Hi! My name is Cher~ from Cheryl's Window and I am so excited to be a Gyptian and also to be a Guest Designer today at The Bug Bytes. Pam is so great at figuring out all the little bugs our Gypsy updates may pick up and showing us how to work around them. She's also a fabulous designer and has a great team of designers. Today is my first posting on her blog as a Guest Designer. And I do have something to share!!! It is photo heavy, so be patient, but I think it will be worth it. 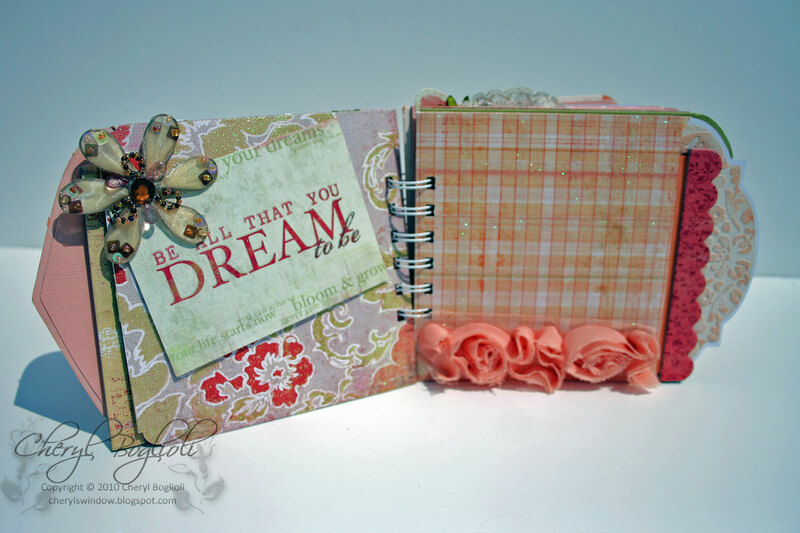 This month's featured cartridge at The Bug Bytes is Sentimentals. 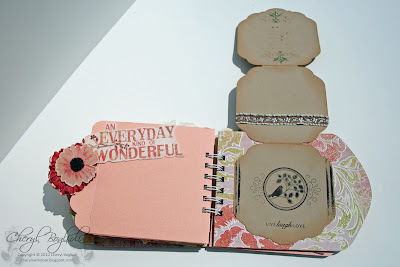 I used the envelopes with coordinating liners to create a fun mini album. So sit back and have a cup of tea or coffee and look at all the little pages. The first thing I did was to size my envelopes to the desired size. I found it easier to start on a 12 x 24 mat. On my file, this is called the Layout tab. 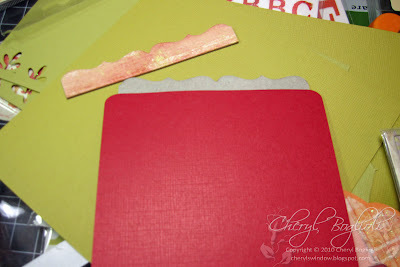 I did this because I wanted to size two envelopes with matching liners making sure that one envelope liner set would fit on a 12 x 12 page to cut, but I wanted to alternate different liners with different envelopes for cutting purposes and to save paper. I didn't want the matching envelopes and liners to be from the same piece of paper. 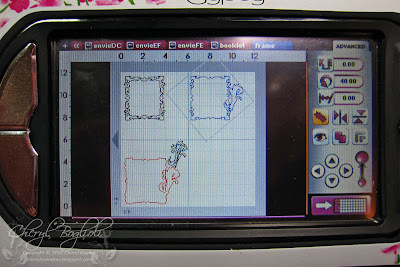 I would copy one set of envie/liner to another tab and then the other set. You'll see that I've named these envieAB, envieBA, envieCD, etc. Envelope A is on AB and it's liner is on BA. Does this make sense to you? AB will cut out of one piece of paper and BA will cut out of another. I'm sure many out there could come up with a quicker wayto do this, but this was what worked for my brain. After laying out my different sets on the left half of the 12 x 24 mat, I then changed size back to 12 x 12 mat. After creating all my envelope sets, I cut them all out using this yummy paper collection from My Minds Eye called Sundress Laundry Collection. I had a whole paper pack stocked with chipboard pieces and lots of rubons. You'll also notice on my Gypsy file that I hid all the score marks. I don't particularly like these score marks when cutting. I like to see where they belong, but I don't like the way my cards and envelopes look when I score them here. 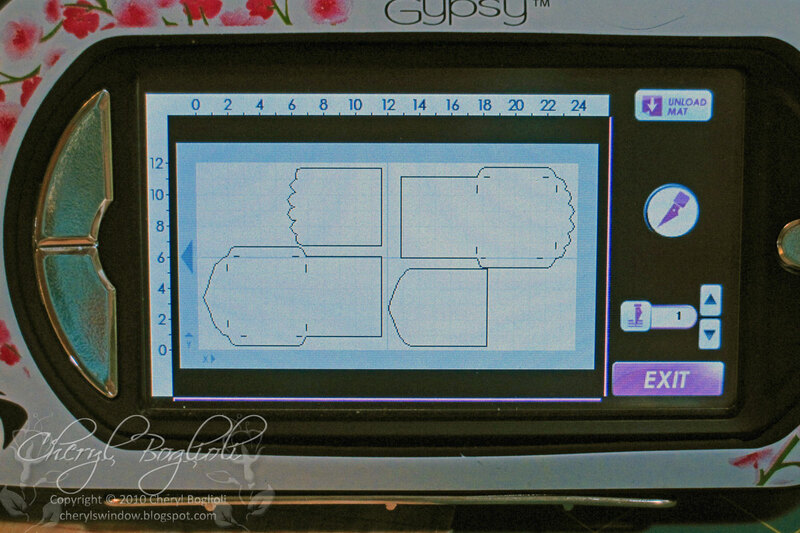 If you want to cut the score marks, just unhide these marks on your Gypsy. 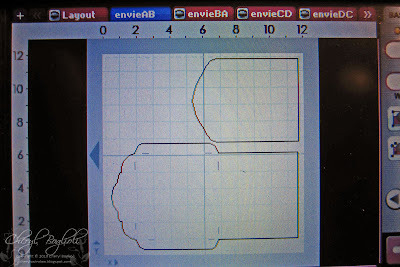 Now, I also found that there was still enough paper left over from this piece to cut out a piece 5.25 x 5.25. This became a separate page inside my mini album. 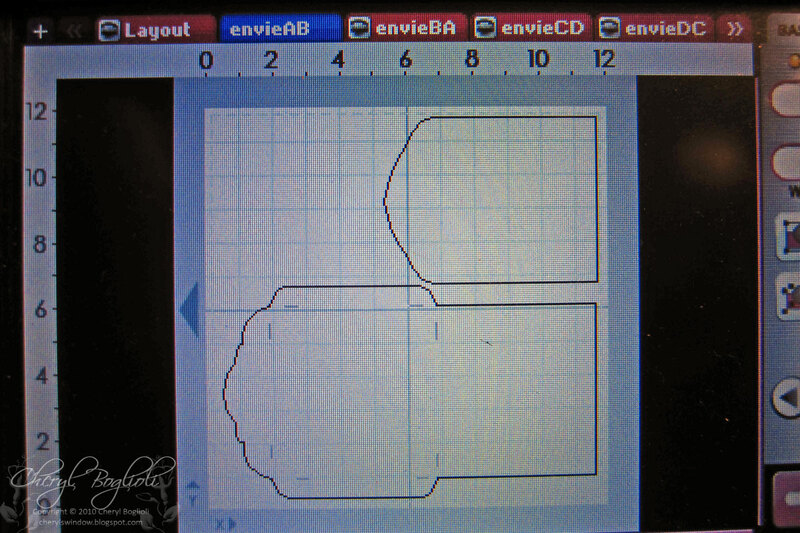 I could have added this square to my cut file, but I decided this after creating and cutting my designs. You could easily add a square inside your template if you decide to do this also. Another element I created was to take one of the shaped cards and duplicate it. 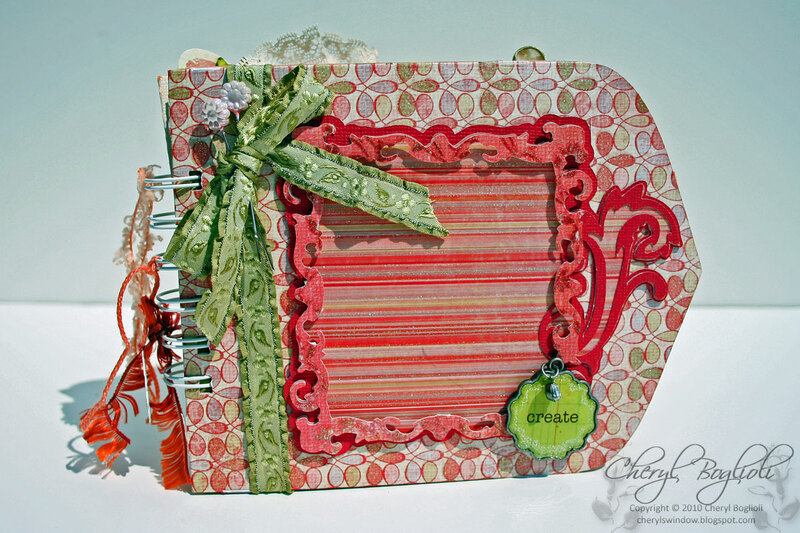 I then overlapped two sides in the center to create this 3 sided card. This was then scored, Z-folded and added to one of the envelope pages. I created a layered frame for the front of my album and welded a swirl to one side. I did not weld the very top layer and swirl because I wanted to use different papers for these two pieces. I matched the top swirl with the shadow background. After cutting this out, I layered it with the top ornate frame popped up with dimensionals. I left the top open so that I can later slide in a photo or journaling block. 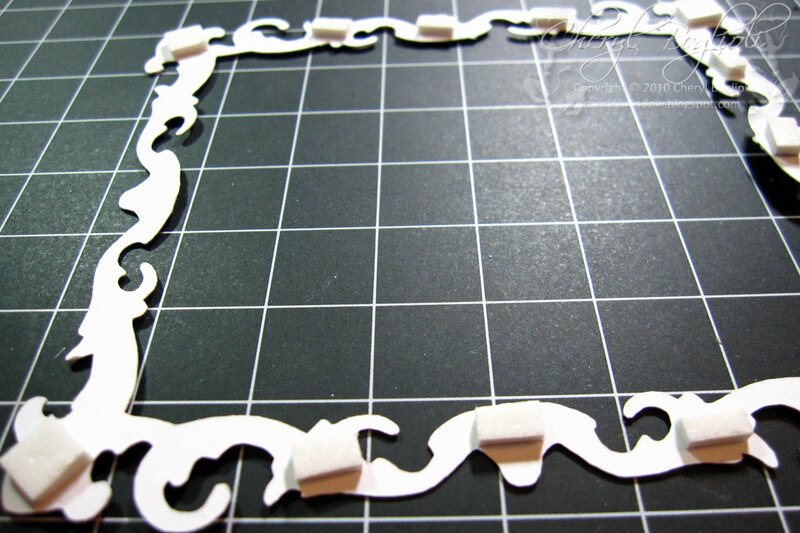 I used mini dimensionals and cut some in half to fit on back of thinner frame pieces. Notice how I don't have any on the top to your left. While putting the album together, I also decided to cut different corners on my inside square pages. I LOVE LOVE these Corner Chompers and use these quite often. 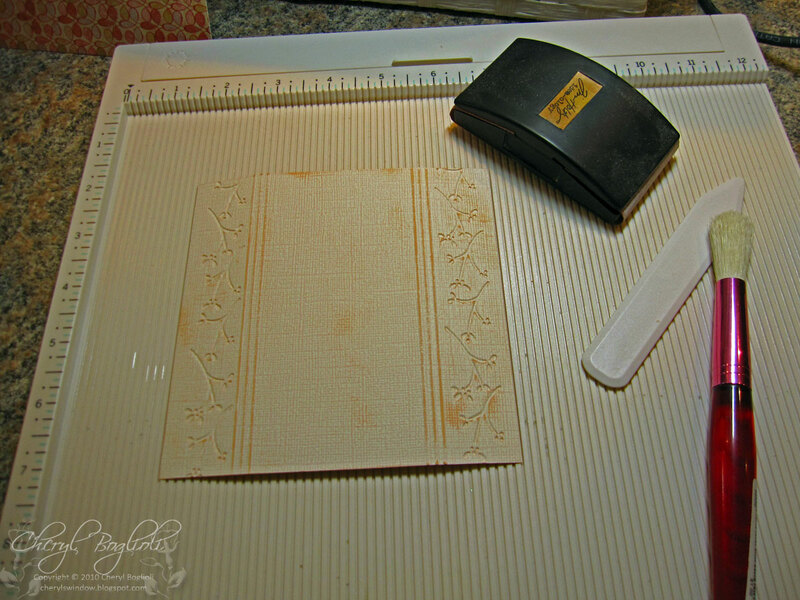 I did any embossing/debossing, sanding, and/or inking at this point. 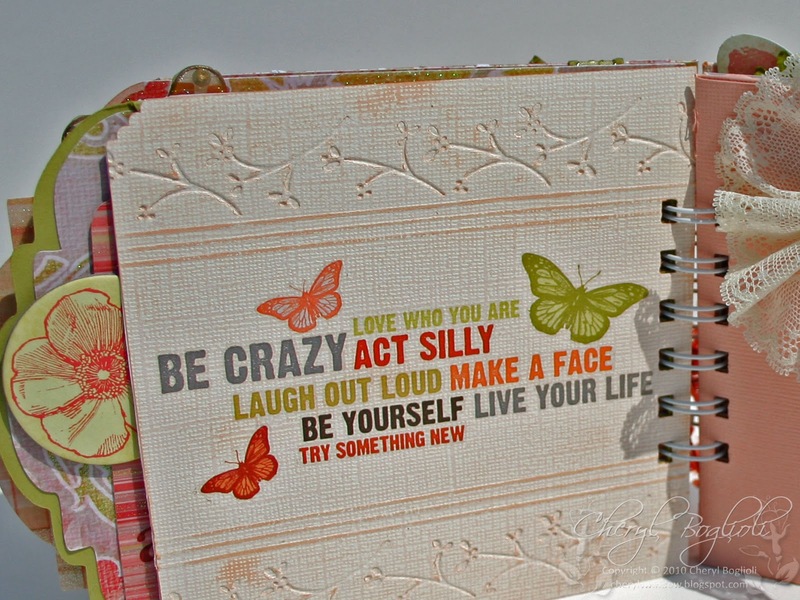 It's much easier to do those things now before you bind your album. 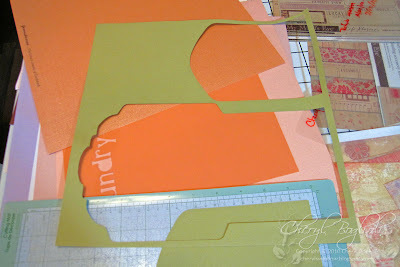 This is a closer view of that debossed and embossed square. I also sanded some of the card. 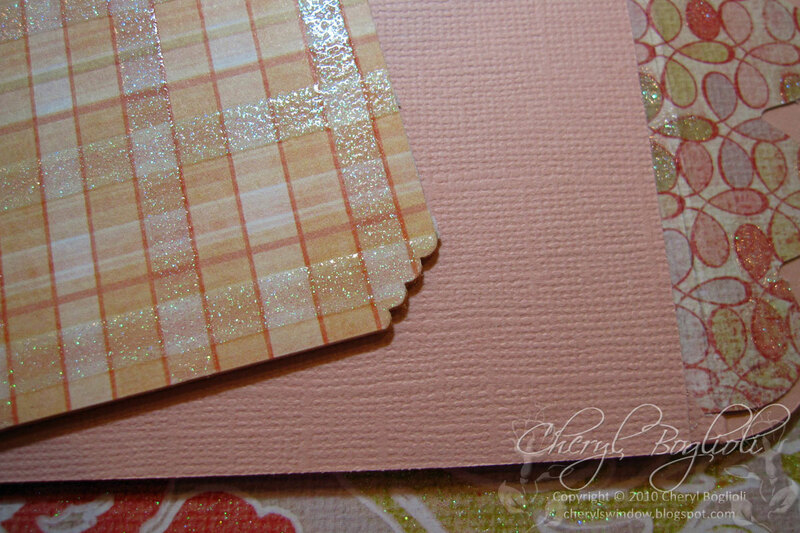 This is a pieces of Core'dinations cardstock. I also added the rubons to the center area. Here is another great tip I've learned. 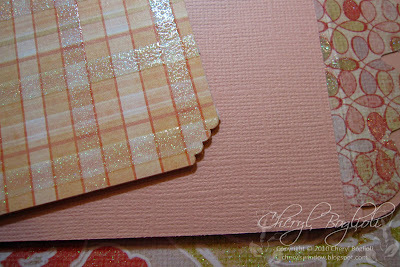 Those chipboard sticker borders that you get in paper packs are so great to cut and add to border of mini album pages. I have learned that, unfortunately, they do not stick so well, especially to glitter paper or each other, so I use a little extra glue to adhere them together. I adhered the liners to the corresponding envelopes and then scored, folded and taped my envelopes. I just lined up the edge flaps on my Martha Steward score-board to score where needed. However, I did not score, fold, or seal the top edge flap. I left this open to create our pocket for our tags. Make sure to use a good glue or red tape with glitter paper. 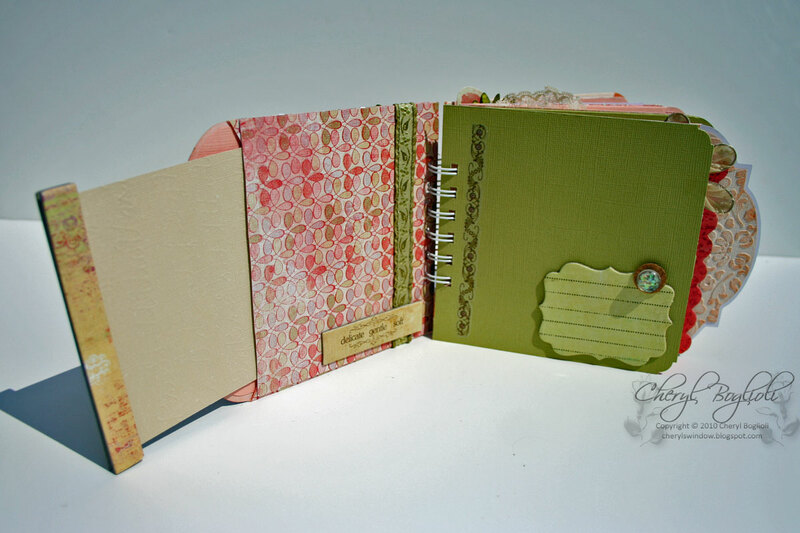 Before decorating my pages and adding embellishments, I punched and bound my album first. I used the my Zutter Bind It All and used the guide bar on the side (you can see it to the right peeking out) to make sure that all of my pages lined up correctly when punching. I put my album together in the following order. First page with back of envelope facing front, square page, envelope with front facing forward, and then repeat this set. After binding, I started playing and decorating. Here are a few of the pages completed below. I did leave plenty of space to still add photos and journaling. 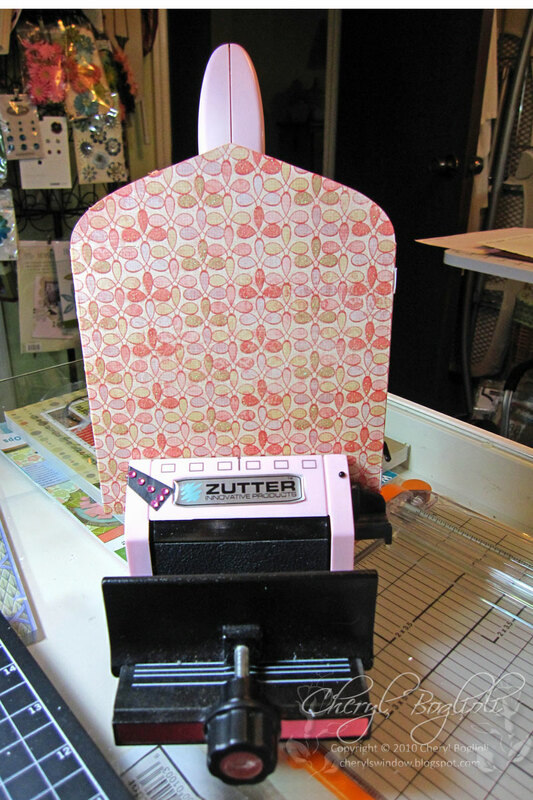 Here is a page with the Z-fold card attached. If you'd like to see the album in its entirety, I did make a quick video hoping that would give you a better view of the mini album complete. 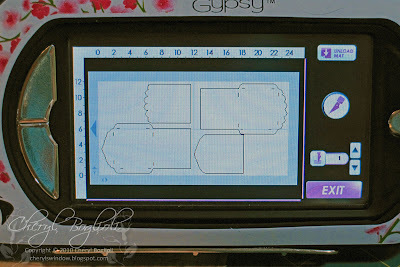 If you would like a copy of this gypsy file, please leave a comment on my blog post and click HERE to download this file. I hope you enjoyed this mini album. If you make one too, I would love to see your version. This was so much fun to put together. This is really great! 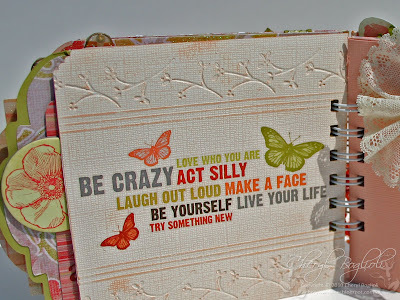 I have to go now and get the paper pack , download the file and make my own! Cheryl this is beautiful! Great detail and wonderful choice of colors. Great mini!! I love the virtual tour of your album....and your voice is so magical....I just want to make this album now!! Cheryl, that album is absolutely gorgeous. Love it. That is just so cute! 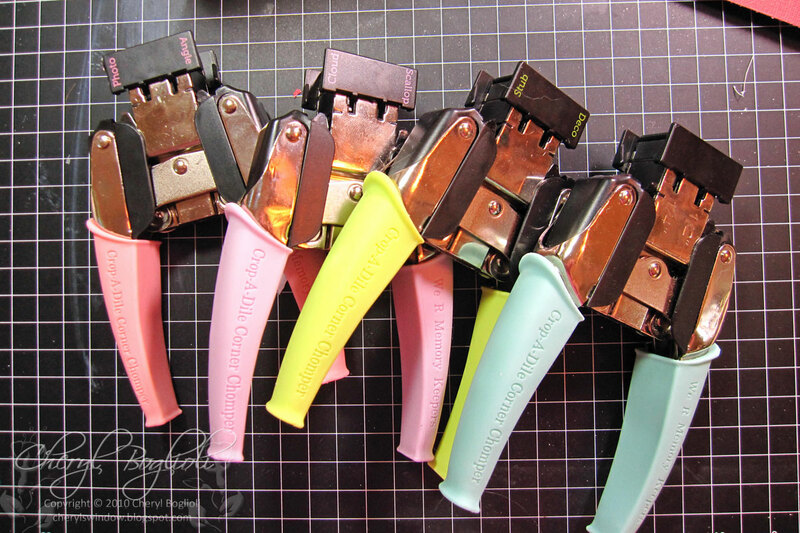 I want to get one of those binder machines. Great job! Love it! the colors are so cheery! This mini album is really cute!! Never noticed how cute those envelopes are, Thanks!! Gorgeous album!! Love all the details! Beautiful album, Cher! I love the colors! I'm going to have to scraplift this idea!